Born in Kyoto. Original name Ishida Shigezaburo; took the name Maekawa from a relative on his mother’s side after father’s death in 1905. Younger brother of Asaga Manjiro. In 1905 entered Kansai Bijutsuin; studied with Asai Chu and then with Kanokogi Takeshiro. Went to Tokyo in 1911; began drawing cartoons for Tokyo Puck (Tokyo pakku) in 1912. Influenced by 1911 exhibition of Minami Kunzo’s prints, began making moku-hanga. 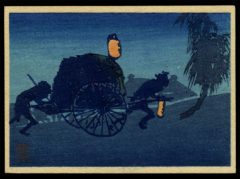 Exhibited with Nihon Sosaku-Hanga Kyokai from 1919; member from 1924. Yogo Lake in Snow, 1924, is a representative work of this period. He continued to make a living as a cartoonist, traveling all over the country to sketch local people and customs. Made a reputation in early Showa as the creator of Hasty Bear (Awatemono no Kumasan), a series of comics in the Yomiuri shinbun Sunday edition about a clumsy bear. Exhibited prints at Teiten in 1927, 1928, 1931 and Shun’yokai in 1929, 1931, 1935. Founding member, regular exhibitor, and stalwart supporter of Nihon Hanga Kyokai 1931-1960. Member of Gendai Manga Kyokai. Contributed to Han geijutsu, Chokokuto, Kasuri, Bakuchiku, Dessan, Shiro to kuro, HANGA, Kaze, and Jissen hanga. Also exhibited at Shin Bunten in 1937, 1938, 1942, 1944, at Sao Paulo in 1953, at Tokyo Biennale in 1957. Made his living as hanga artist from 1953. Due to controversy over membership in more than one hanga organization, withdrew from Nihon Hanga Kyokai shortly before his death in 1960. Briefly a member of Nippankai. His affectionate depictions of Japanese manners and customs are in many single prints and albums including a series of 5 volumes of Hot Spring Notes (Yokusen fu), 1944-1959, and Leisure Time Leisure Books (Kanchu kanbon), 1945-1960. Usually signed his prints with one or more of the kanji for his name but also used the first three letters of Sempan. ** Taken in whole, or in part, with permission from: Merritt, Helen and Nanako Yamada. Guide to Modern Japanese Woodblock Prints: 1900-1975. University of Hawaii Press: Honolulu. 1992.